Petit Vour is a monthly vegan beauty subscription box. 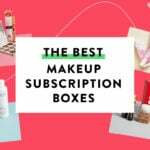 It’s a great box if you’re looking to try out new vegan and/or natural beauty products. LIMITED TIME DEAL: For a limited time, use coupon code MSAPETIT to save 25% off of your first Petit Vour box! (Regularly $18 a box). The Products: Vegan and cruelty-free makeup and beauty minis. Each box comes with a folded card detailing the items included, and their prices. So I probably could have used the lighter “fair” shade in this concealer, but maybe in the summer, I can reach for this! Your girl needs some sun! This formula smells like lavender, which I am really into. Why shouldn’t concealer smell amazing? It is a heavier texture but it blends easily without harsh lines. In terms of concealing redness or dark circles, it does very well! It has argan oil, green tea, and vitamin E, so in addition to hiding uneven tones or blemishes, your skin will also benefit from its nourishing ingredients. Normally a coffee scrub is not enough to get me too excited, but I like this one for a couple of different reasons. It is a sugar scrub, which I will always pick hands down over a salt scrub. Salt scrubs ake my skin feel stripped of its natural hydration and make me itchy. Nope! The second reason I like this scrub is that there is some spicy essential oil magic happening in the formula. I used to work at Starbucks, so the scent of coffee doesn’t do anything for me. But add in some essential oils? Yes, please! It is a different and more complex scent experience. This scrub did a great job of exfoliating my skin without feeling too scratchy or drying. This clear and slightly slimy serum has virtually no scent an absorbs immediately! (I do not consider sliminess a bad thing when it comes to serums.) I did not find it super hydrating, though, in all honesty, my skin is like a dry sponge this time of year, so t takes a lot. The main hero ingredients in this formula are Ferulic acid and Vitamins B, C, and E. The Ferulic acid is likely the biggest player in this elixir, as this acid is found in the cells of plants and helps their cell walls remain strong. It is said to help with puffiness and skin elasticity. I already have a tube of this wonderful lotion in my handbag! I love rose scents so this product has been a favorite of mine for a while. I am always glad to get more to refill my stash. The smells is mainly of roses, but not in an old lady sort of way. It is very hydrating and absorbs quickly, without leaving a greasy residue behind. Verdict: This box has a value of $47.28, which is good for an $18 beauty box. Petit Vour is always really exceptional at sending out smaller and less well-known beauty brands that you can feel good about because they are vegan and cruelty-free. I loved the full-size concealer even though the shade was too warm for me, and even got a restock of an old favorite lotion this month. The coffee scrub was effective and left me smelling great. Though I have serums I prefer to the elixir sent this month, it is always good to try something new. Can you still get this box if you sign up today? No, you will receive the January box. This page will tell you which box you will get when you sign up. Alternatively, each of the 4 items has an average cost of $4.50. Check out all of our Petit Vour reviews! What do you think of the December Petit Vour box? What was your favorite item in this box? How do subscribers rate Petit Vour? Do you subscribe to Petit Vour? Add your rating now!